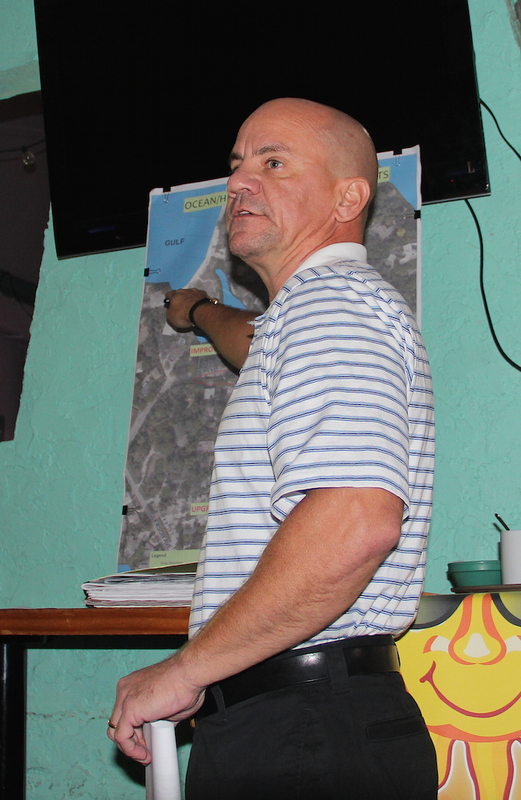 As the sand in Big Sarasota Pass has shifted over the years, and more beach has accreted on the northern part of Siesta Key, the drainage system that used to allow stormwater to flow to the Gulf of Mexico has been disrupted, Sarasota County stormwater engineer Ben Quartermaine told The Sarasota News Leader this week. The design calls for stormwater to percolate through the ground before it reaches the Grand Canal, he added. Staff proposes to pipe that ditch and then add plantings similar to those in the new parking lot at Siesta Public Beach. 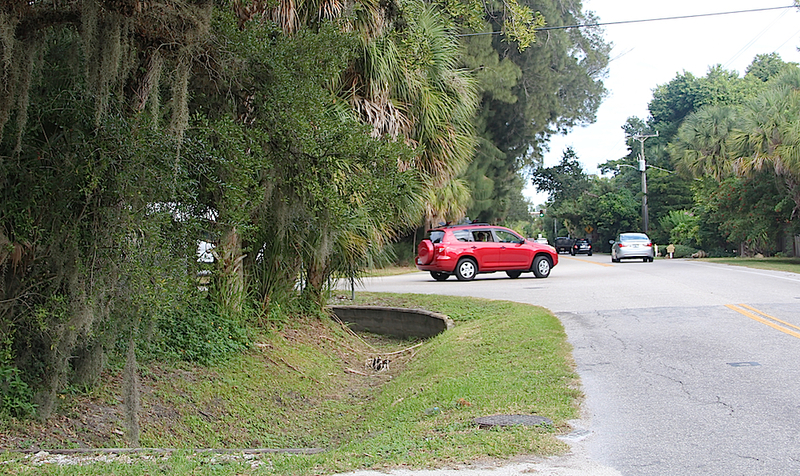 Similar work will be done in the ditch along Higel between Ocean Boulevard and Reid Street, he indicated. In a Dec. 1 telephone interview, Quartermaine told the News Leader he hopes to have the necessary permit in hand before the end of the first quarter of 2016. As part of that process, he and other county employees are meeting with residents and business owners on Siesta Key, as well as with the property owners in the affected area. 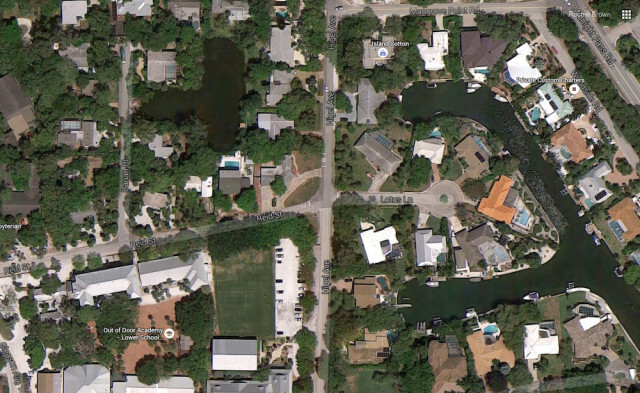 Quartermaine was scheduled to make a presentation on Dec. 3 to members of the Siesta Key Association. Matthes added that business on the Key does not slow down until after Labor Day. SKVA board member Kay Kouvatsos, co-owner of Village Café, suggested the first full week of September would be a better time to start the project. When County Commissioner Al Maio, a guest at the meeting, asked about the cost of the project, Quartermaine said staff estimates it will be between $300,000 and $400,000. SKVA Vice President Mark Smith asked whether any lane closures would be necessary during the work. Quartermaine replied that he doubted that would be necessary. However, it is possible, Quartermaine added, that one lane might need to be shut down to traffic for perhaps 15 or 20 minutes at a time to facilitate some of the construction. 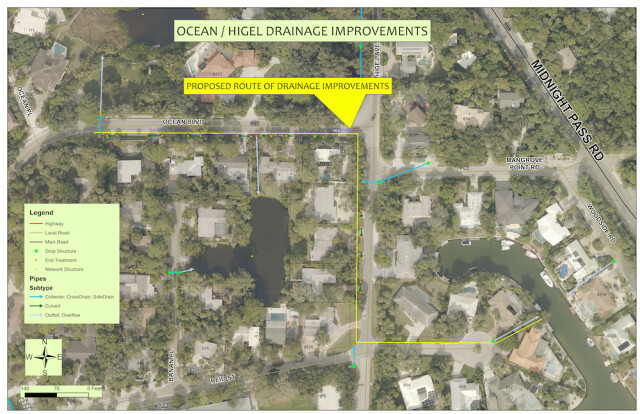 Asked how long he expected the project to take, Quartermaine estimated three weeks for the construction in the area of the Ocean Boulevard/Higel Avenue intersection. Another part of the project will take an additional three weeks, it said. That will involve work on Lotus Lane, which is on the east side of Higel Avenue, across from Reid Street. He has talked with the homeowners on Lotus Lane, he added, assuring them that they will have 24-hour-a-day access to their driveways when that part of the project gets under way. When Smith asked whether any of the work could be pursued at night, Quartermaine told him, “It’s a safe option during the day.” If it proved necessary, work could be done at night, he added. Still, he said, he would feel better paying for a crew to help with traffic flow in the daytime instead of pursuing the project at night. In response to a question from SKVA Treasurer Roz Hyman about where staff plans to stage the pipes, Quartermaine pointed out that the county can use the property where the former Siesta Key sewer treatment plant sits, which is a short distance from the project site. Material can be offloaded from trucks and set into place quickly, he added. If it proved necessary, he continued, staff could look at using right of way in the immediate area of the project. After Siesta Key Association President Michael Shay noted that drivers tend to throw a lot of trash into the ditch on Ocean Boulevard, Quartermaine pointed out that, as part of the treatment system, a basket will be used “to catch floatables.” Then, the county’s vacuum truck will clean out the debris, he added. Quartermaine told the News Leader on Dec. 1 that planning for the project began about midway through 2014 and intensified in the latter part of that year, after the county brought a consulting engineer on board to assist with the design. “We’ve spent the better part of a year looking at different alternatives,” he added.